Much of the "contrast" in MR images arises from differences in the T1 relaxation time between normal and diseased tissue. For example, tumours normally exhibit significantly longer T1 values than their surrounding normal tissue, making them stand out in MR images. Studies over the years on small tissue samples have shown that the way in which a tissue's T1 varies with magnetic field could also be a potential indicator of disease. However, that information is completely invisible to conventional MRI scanners, because each scanner can only operate at its own magnetic field (e.g. 1.5 T or 3.0 T). The aim of our project on "Fast Field-Cycling MRI" (FFC-MRI) is to build and use new, very special types of MRI scanner in which the magnetic field can be switched (or "cycled") during the scan, so that the pattern of how T1 varies with magnetic field can be measured. This new type of MRI should be even more sensitive to changes in tissues brought about by disease, potentially allowing earlier and more reliable diagnosis of some medical conditions. We have built a range of FFC-MRI scanners which have allowed us to perform relaxometry studies and field-cycled MRI measurements of large samples, as well as human volunteers and patients. Our equipment can be seen on the Facilities page. Fast Field-Cycling Nuclear Magnetic Resonance (NMR) has been used for decades in order to measure the variation of T1 with magnetic field strength of small samples. A field-cycling pulse sequence comprises three distinct periods, called "polarisation", "evolution" and "detection", each applied at a different magnetic field strength. The magnetic field during the evolution period can be changed, but the field applied during the detection period is always the same, so that the NMR signal is always at the same frequency. Field-cycling pulse sequence, showing the three periods. Relaxation takes place during the Evolution period, while signal detection occurs during the Detection period. A field-cycling relaxometry experiment involves repeating a T1-measurement pulse sequence - e.g. Inversion Recovery - each repetition using the same Detection field but a different Evolution field strength. The result of the experiment is a set of NMR signals obtained after the spins have "evolved" at a range of field strengths, and these can be analysed to produce a graph of T1 versus field strength (the T1 dispersion curve). 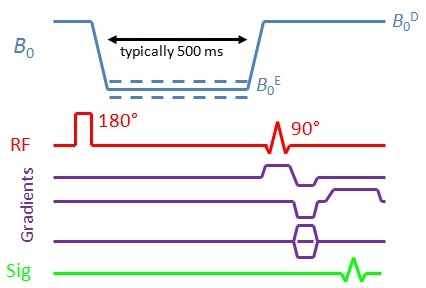 The diagram below shows an example of a field-cycling relaxometry pulse sequence, which has been adapted for MRI by the addition of magnetic field gradients during the detection period. Whereas one might expect to see a gradual, smooth increase in T1 with field strength, with biological samples this increase is often superimposed by three pronounced "dips" where the T1 value drops by 10 to 15% over a small range of field strengths. These are known as "quadrupole dips" and are found at well-defined field strengths (16 mT, 49 mT and 65 mT) where the Nitrogen-14 nuclear quadrupole resonance (NQR) and the proton NMR frequencies are equal. T1 is reduced at these field strengths because the nuclear spins of hydrogen atoms on the "backbone" of protein molecules are strongly coupled to the nuclear spins of adjacent nitrogen atoms, and this enhances the efficiency of proton NMR relaxation at the NQR frequencies. T1 dispersion curve measured from a volunteer's forearm. Quadrupole dips centred on 49 mT and 65 mT can clearly be seen. In fact, the "depth" of the quadrupole dips provides information about the concentration of protein in the sample under study, and we are investigating the possibility of protein imaging by "quadrupole-dip" MRI. By implementing a field-cycling inversion-recovery imaging pulse sequence, it is possible to collect images "on" and "off" a quadrupole dip. In areas of the body with large protein concentrations these will exhibit markedly different signal intensity. This is demonstrated in the images shown below of a volunteer's thighs, obtained with the evolution field set on- and off- the quadrupole dip at 65 mT. Muscle regions appear significantly darker (i.e. lower NMR signal) in the 75 mT image compared to the 65 mT image, due to the differences in T1 of the tissue at the two field strengths.